It is fabulous to sit down placing words in TKK’s editor this morning. Over the long stretch we did live with those new challenges I mentioned (words “cancer patient & break-up”) but were knocked back by a sudden loss mid-November also in our immediate family. That side had just buried another older family member the month before. 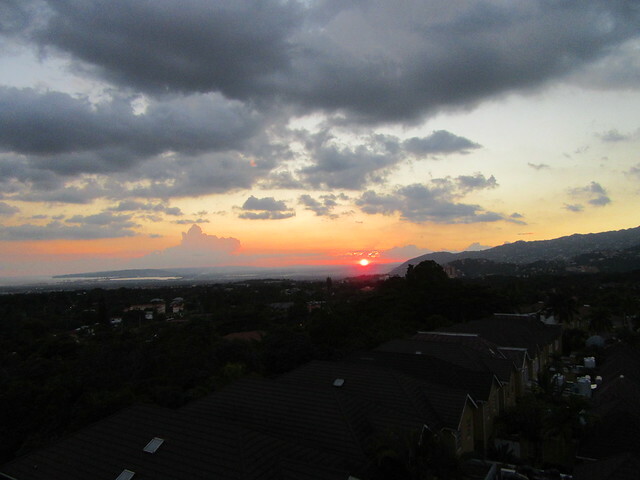 This is one of the new views we enjoyed from a balcony overlooking St. Andrew & Kingston but after the most difficult day. The grief meshing with a long-delayed trip was tough, and we all have needed the comfort of time to reconcile these very different feelings. One night on the North Coast was with rough seas. The reason for leaving Kingston at this point was also a painful but necessary chore that was handled well in the end. It absolutely did not help that N was sick or that almost everyone was overwhelmed. In addition to explaining this TKK break the pictures are helping me to re-think my assumption that at least 1 image can go in on T’s big school project. Pausing to reflect is a good thing in such a busy week. 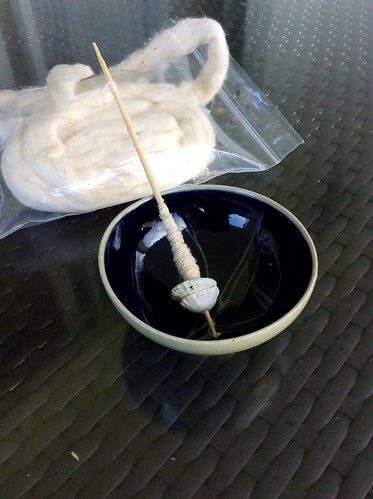 The clay bead whorl spindle from West Africa came with me in the carry-on bag. 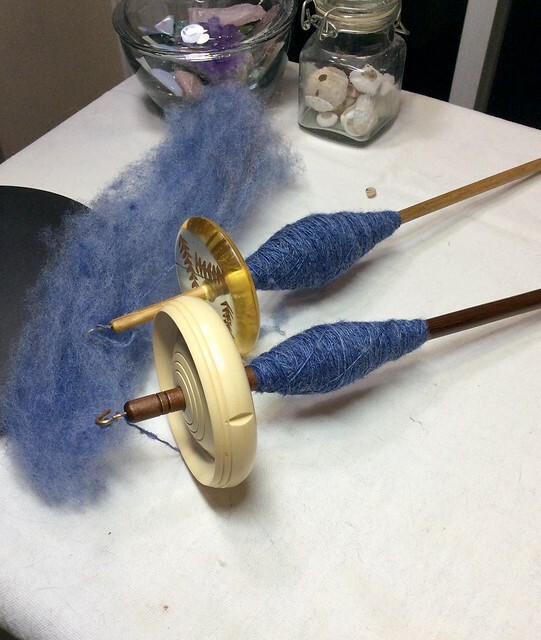 Cotton is basically what I love to spin in Jamaica but this combination was the best plan yet. As of today, I have a 12 g plying ball from this project + a fairly full new cop. 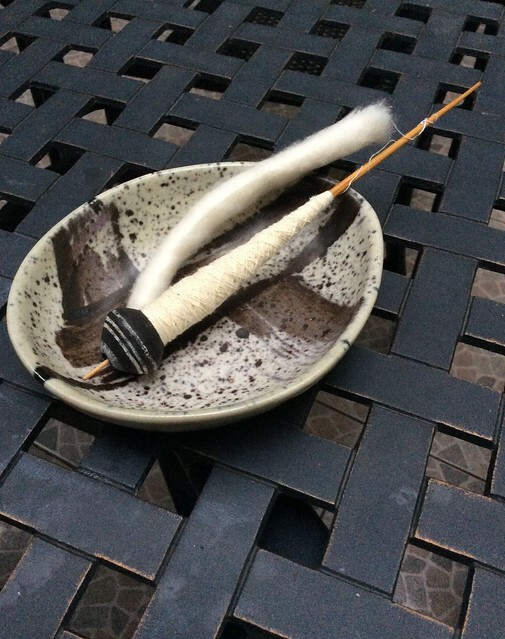 The dish stayed behind but is by a Jamaican artist, and was surprisingly awesome as a support bowl. I have asked for one! 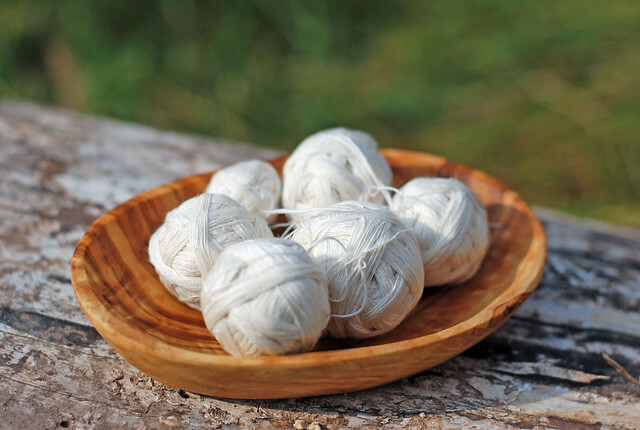 When I started learning to spin cotton, I had no clue that it is SO very good for the exhausting, emotional seasons of life. That should be said loudly enough for those of us in the back to catch-on. It’s SO GOOD, everyone. We have now finalised the formal family steps, thrown our first birthday party (T is 6! It went well! ), and are planning a new event with family visiting us for June aka the best month. Of course, the grief is still with us but its edge has lifted a little. The prognosis for our cancer patient is thankfully encouraging. The other difficulty of the break-up is still unfolding but as well as can be expected. I am making my way through the to-do list logically, and that’s also a good thing. New year; new small loom! 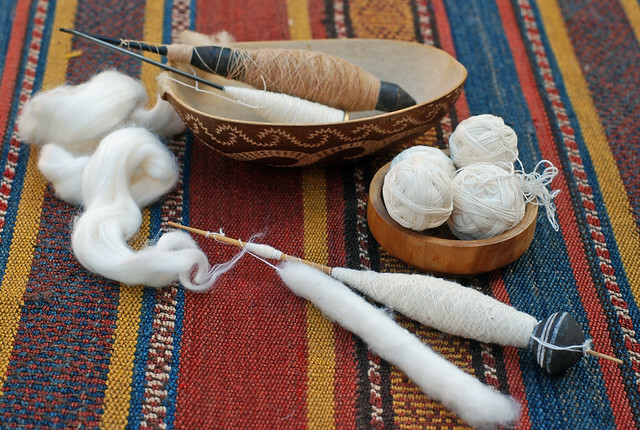 This January brought the wonderful gift of a new Erica table loom kit from Louet NA. Shafts 3 & 4 are on order. 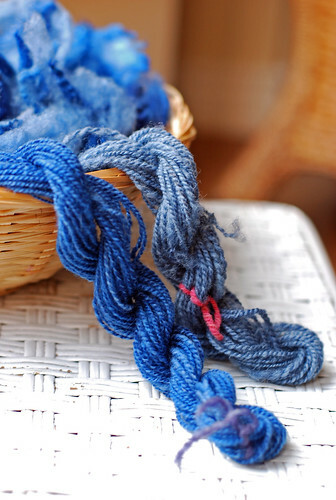 The threads for this plain weave are handspun Gulf Coast Native dyed in the wool by Sheepspot. 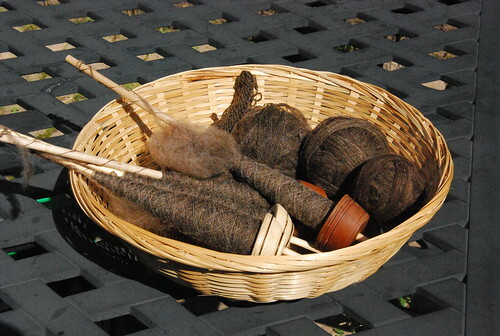 The combing portion appeared on TKK here and gave a lovely 164 yards of 3-ply. 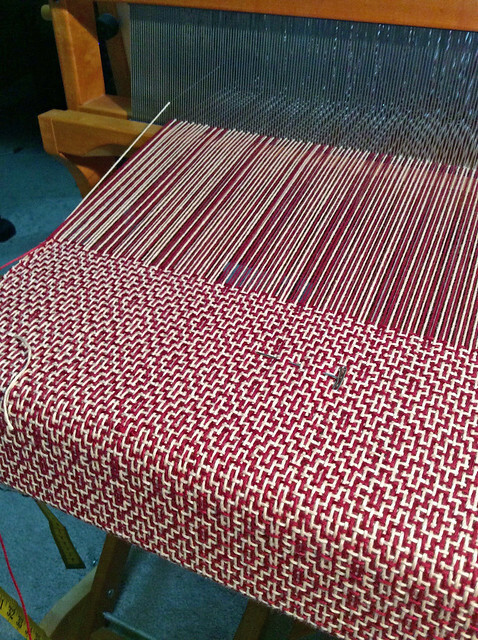 The warp is 9″ wide in the reed, 2.5 yards long. Let’s skip my back beam mistake because it worked out, and Warped Weavers’ members were ready with good explanations for me. 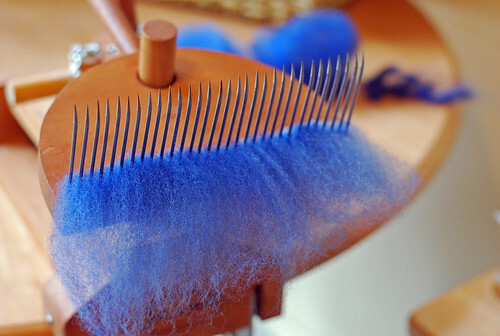 The weft was the carded waste (yes, I have a Pat Green blender/carder!) 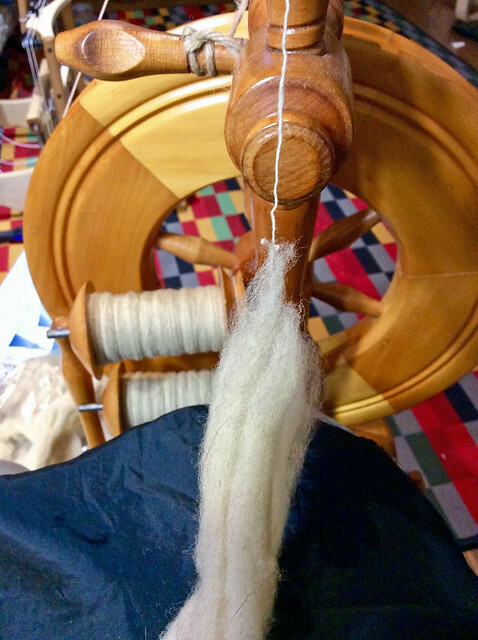 spun on spindles for the Tour de Fleece last July. 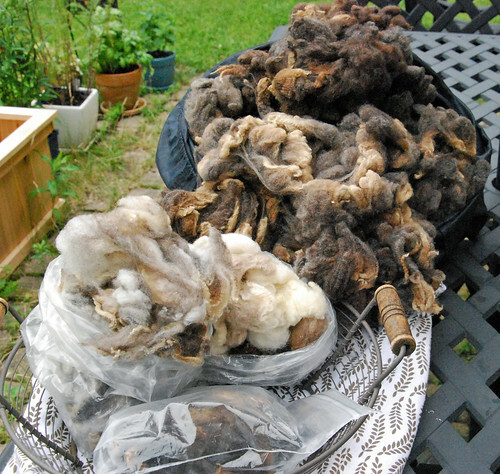 The combed waste is blended with white Polwarth X Port locks & Tussah Silk for 151 yards of 2-ply. It was a great whimsical spin, and I wanted them both together in a project. 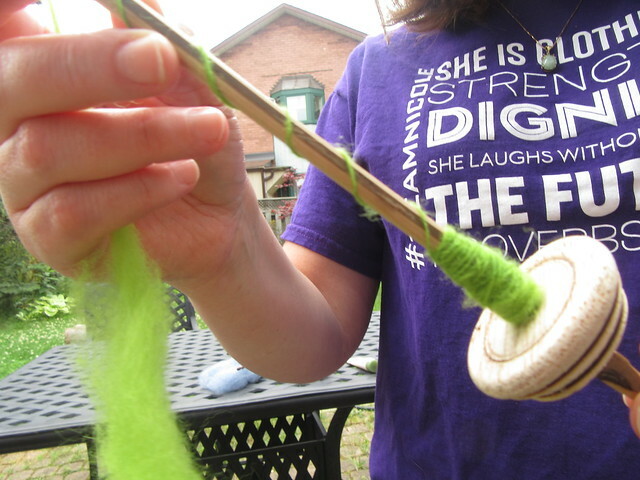 Weaving with T on the Erica was the most special part of the weekend project. This was in January, and tiring but totally joyous. The Devil has been in the last steps for projects, weaving & otherwise. This cloth & 2 scarves that I wove a week ago on the Mighty Wolf are in queue for pressing. I wet-finished all 3, and have other projects working on. 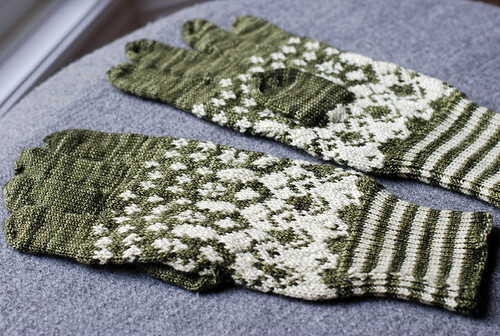 Some WIPs finish quickly, especially the utility knits like mittens, spinning. The pulling-up of new socks is to tighten that drift, and to write more often. Shorter bursts are an option I don’t quite stick… This was after all going to be a short post & look at the time! We have renewed TKK’s no-ads purchase, and I am considering the angles. 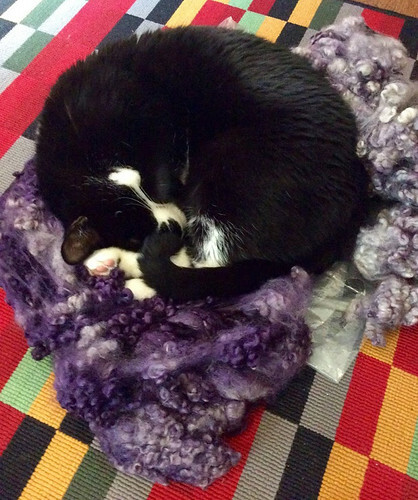 It is true that the fibre work has trimmed itself down but the same categories are full of promise. Dye gift from N & don’t forget the fleece to be cleaned! Right up there with washing my October fleece! The larger projects are still WIPs and not sleeping even though I fell behind on sharing as a log of that work. 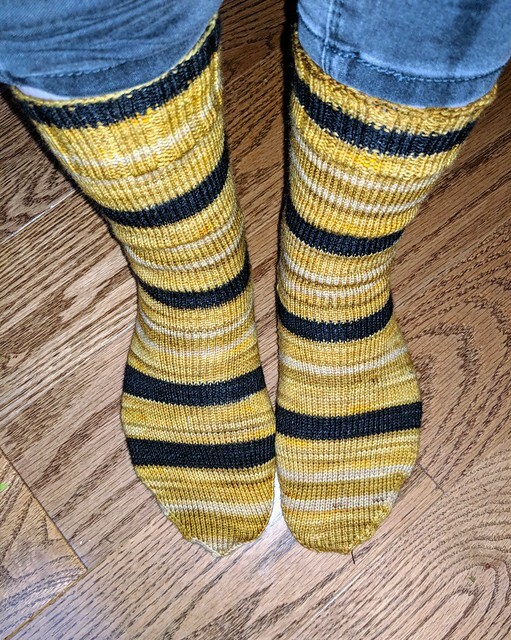 For today we have a post, and the socks on my feet/in the post are the Kissing Cousins pattern by one of my favourite designers, Sarah Jordan. They are ingeniously conjoined! 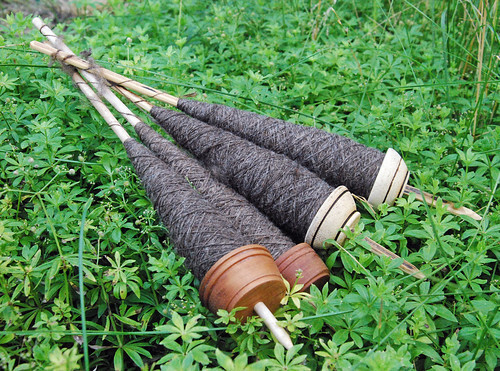 Categories: Fiber Preparation, Finished & in the wide world, Natural Dyes, Spinning, Things Jamaican, Weaving | Tags: drop spindle, Gulf Coast Native wool, Louet Erica loom, Romeldale/CVM wool, Sock, Spinning, supported spindle | Permalink. The Elin towels from my last post were fully finished by the start of June. This was the last daylight they have seen! You must be very patient! My stock response of no and pivoting to the true family trait of stubbornness no longer sounds even technically correct. There is a new need to cultivate patience. Life is catching me behind my natural pace for new skills and challenge projects. In between cutting this warp from the loom, and finishing steps, I learned that a good acquaintance who lives near to us was seriously ill. We were high school friends, and she had moved to Canada before we did. Even with overlaps in circles at home, I only realized at the end of April that she had been in hospital for most of winter. This arc of being able to rise to the occasion has been fulfilling in many ways. It has also shown the upper-limit of my time and energy is not that far from resting state. With the new awareness of how slim my margins truly are (as opposed to wishful thinking), I will focus on sustaining my home practice. This meant answering with a no thank you for a teaching opportunity. It’s a new and frankly unexpected patience. Teaching T to spin with an Andean Pushka! 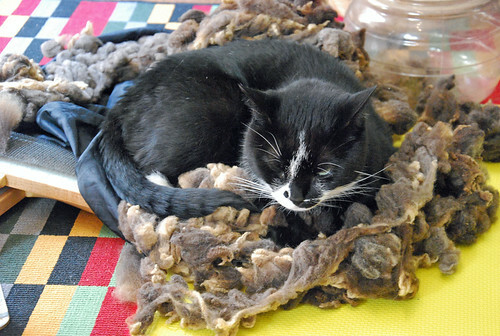 It has meant that I could participate in the Tour de Fleece even as it crossed both of our mothers visiting this summer. The guest bed does close my loom… Patience is a virtue, right? That too passed, and the Mighty Wolf breathes again. This dug into my brain a little – spring sampling and all – and is a set of 2 rosepath combination twill baby blankets from a 5 yard warp. 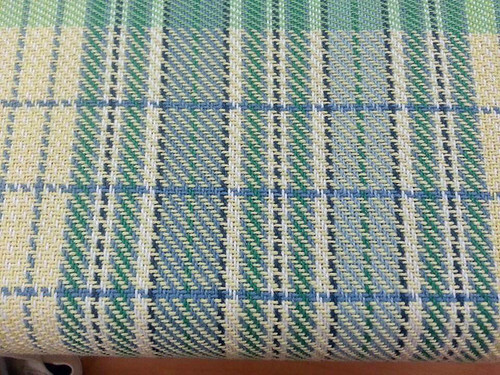 This is the first with the entered colours reversed as weft. It is a 14-thread repeat, and was a joy to weave. I used a new Leclerc temple, and have Beam me Up Scotties finally on the cloth beam. Black lacing is banished forever! As patience has its limits, I also bought an electric bobbin winder that I used in weaving the 2nd blanket on this warp. 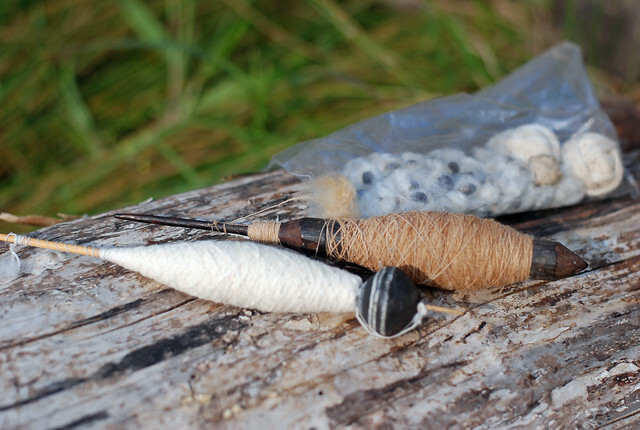 Time for this post is slipping away, and I best get to the cotton spins. They are the very soul of a patience I never had. Good thing that I am both stubborn and thrilled to have something meditative for these nights after navigating the unseen special needs of our home life. The loose goal is to perhaps use these as weft singles. The goals are even more loose with these. It starts as ideas to spin with new tools, and I let it lead me. These are closer to my new pace but also to hearing our friend’s advice to parent for the long haul. None is overblown – we are going to do well if we can. This summer it meant 1 short day-camp, 2 house guests, no break from the home, and hitting our prime family outings. Much like blog posting was left undone. I am trying to embrace both WIPs and the progress that lives in them. As tiring as this phase has been on different levels it is helping so much. We can see new things are possible, and add them as we can. It’s not just short, silly projects as I feared. It’s also not going at my own way and pace. 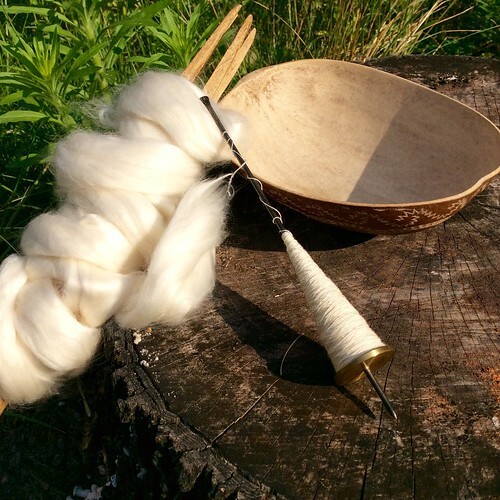 Categories: Spinning, Weaving | Tags: 8/4 cotton, African bead whorl spindle, Baby gift, cotton fiber, handspun yarn, handweaving, Indonesian spindles, kitchen towels, Spinning, supported spindle, takhli spindle | Permalink. Happy new year! 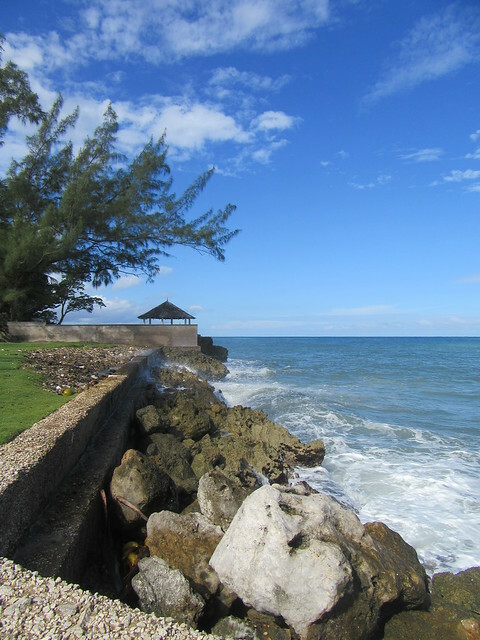 Our holidays were spent back home in Jamaica. It was the mix of what we call Christmas breeze, friends and family that made this trip extra-special. 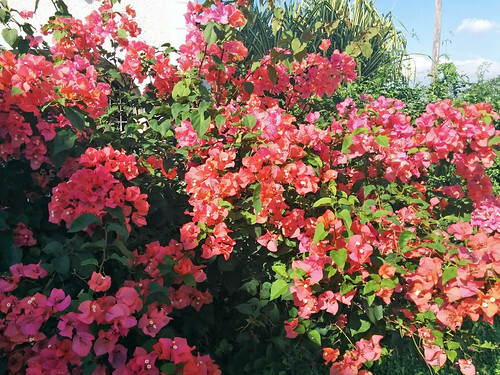 Inspiration came by more than sheer natural beauty. 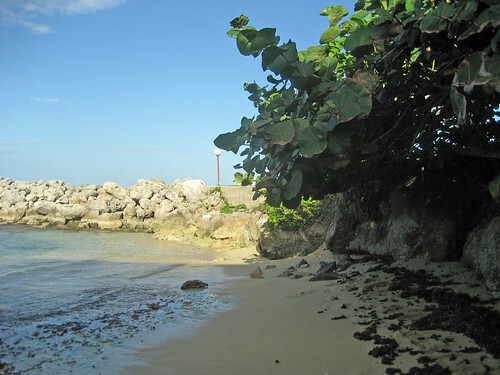 The island is still dealing with the Chikungunya virus outbreak. 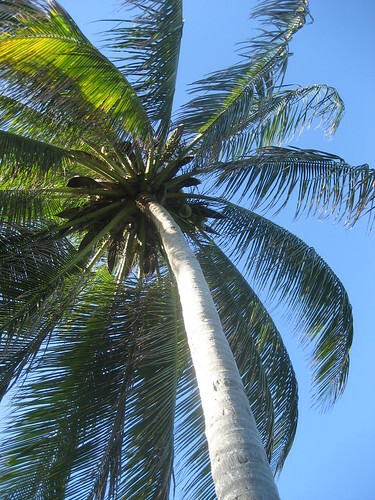 It is transmitted by mosquitoes, and last October the government declared ChikV a national emergency. We are not infected but close family members are still coping with serious joint pain, and other symptoms. In meeting ChikV, the economy, and not to mention personal challenges, I am inspired by the strength & creativity of people back home. Things are difficult for so many that we know & love. 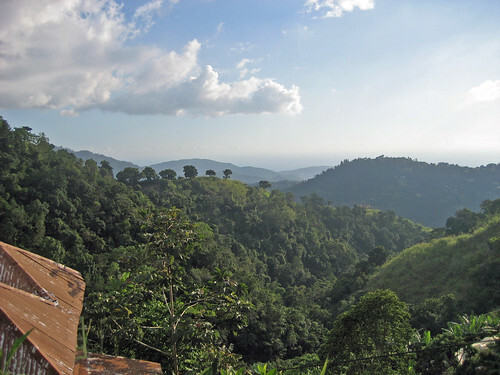 Any view of the Blue Mountains is beautiful. This was on the patio after lunch at Eits Cafe in Newcastle. I grew up with a similar tree-line view from the bedroom that I shared with my brother. The land is green. 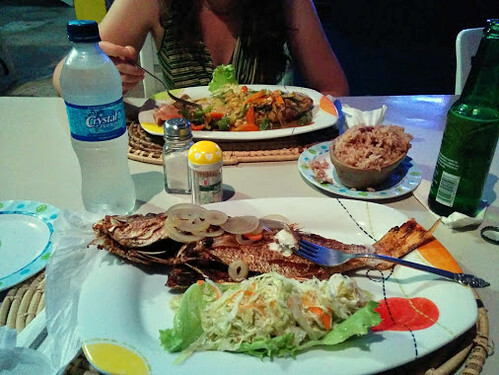 Our waitress at dinner in St. Mary on the north coast came back to make sure we understood how the snapper would be plated. “That’s what we want! Whole fish!” She smiled, approvingly. Returning to visit the first art gallery I ever loved. 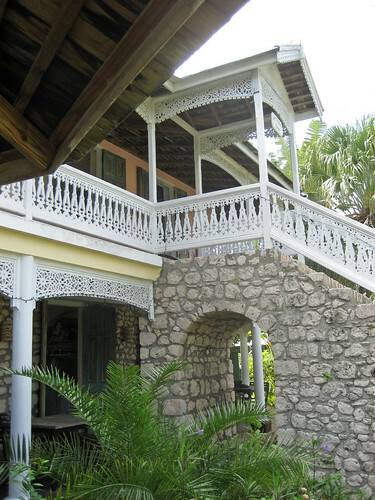 The old great house, Harmony Hall is just as lovely as ever. We enjoyed our visit & the freshly-squeezed limeades immensely. 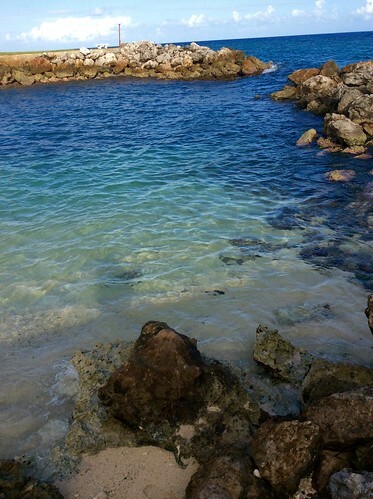 Every good beach no matter how small needs good shade. The best seashells came home with me to Canada (hints: look under the seaweed; use a stick; avoid sand-flies). These two saw immediate love with the cotton spinning! 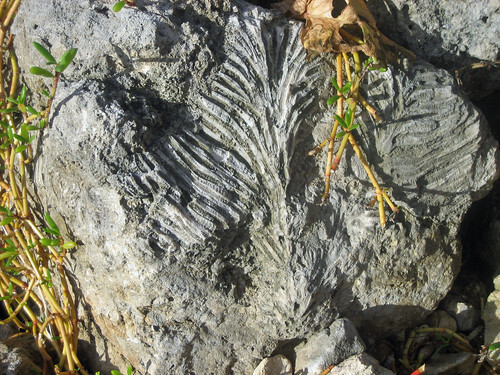 Just looking down at the beach, sometimes you might find fossilized coral. This one survived the area’s blasting. 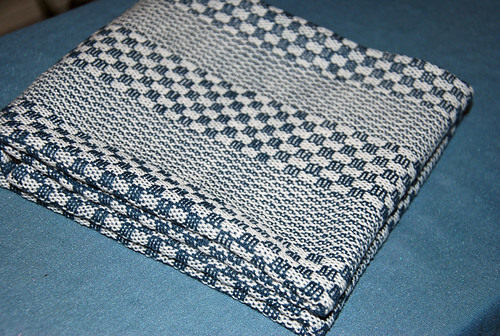 This is 1 of 6 handwoven towels that I finished in time for Christmas. Taking the other 5 home for hand-hemming was how I got them all done! 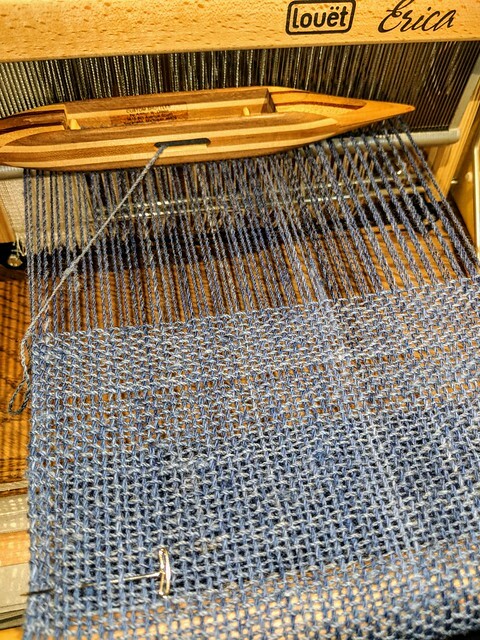 I rushed to weave more towels in this 2/8 cotton using the denim colour for warp. The progress story & were surprisingly popular with friends & family, so I had to make 2 extras! Christmas gift towels on the loom! 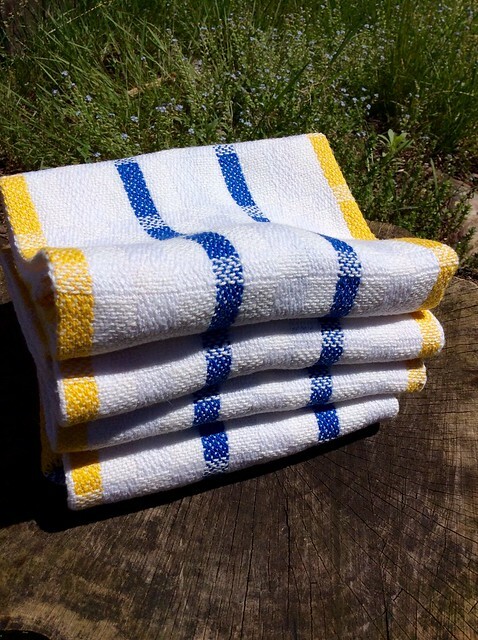 These are the Keep it Simple towels by Mary Ann Geers. Diane helped me fix a sleying error after the first towel, and she flagged what I soon discovered was a silly tie-up error. Another friend, Margaret, has enabled me into some excellent weaving pattern books just this week. Lots to learn this year about structure! Luckily, there is still more inspiration in baby form. My brother & sister-in-law are expecting! 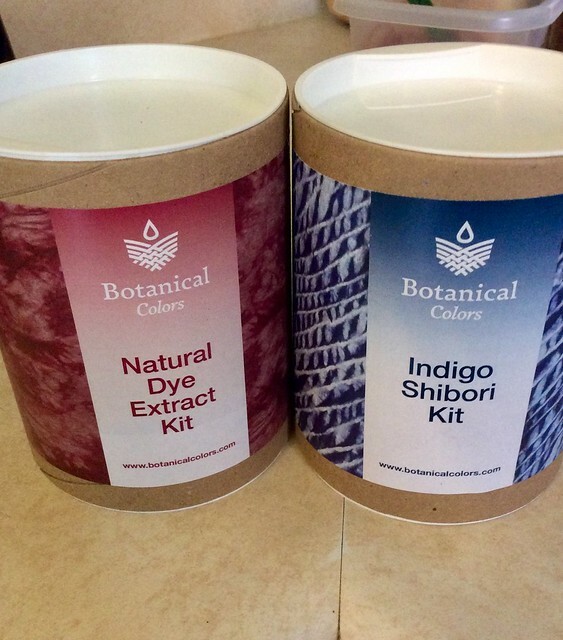 We are so thrilled, and this is the launch of All The Plans! The top book here is very important: “Knitting Counterpanes” by Mary Walker Phillips. 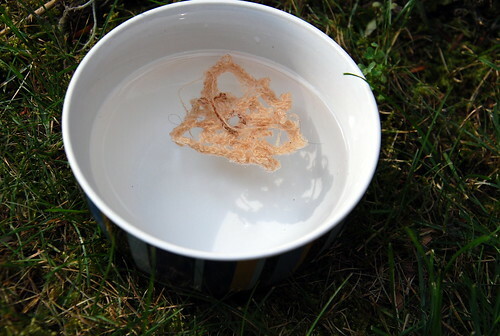 I think my handspun Romney yarn may be perfect for a small-sized knit counterpane. See the two folders above the backstrap loom book? They are pick-up patterns recorded by Catherine A. Stirrup from designs of Peru & Mexico. 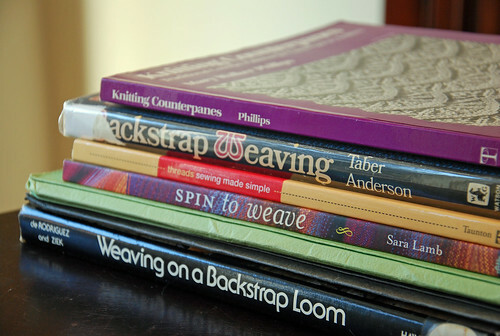 A weaver kindly sent them to me with the backstrap weaving books in her destash. Welcome to the herd, Tabachek spindles! To much fan-fare, I opened a superbly packed box with the 2 Tabachek spindles (right, above) & a surprise. This was late last year. 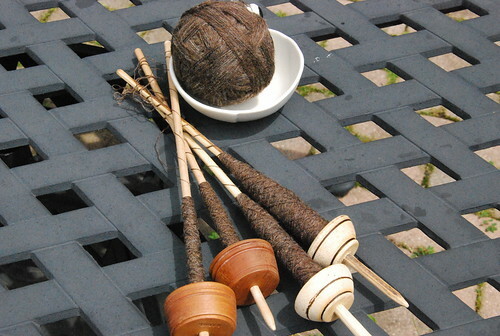 When my friend, Devin, offered the spindles to me, I was so thrilled! They are a favourite make, and holly was a quiet dream as well. Devin, they are loved, and see regular use both at home, and at spin-ins! 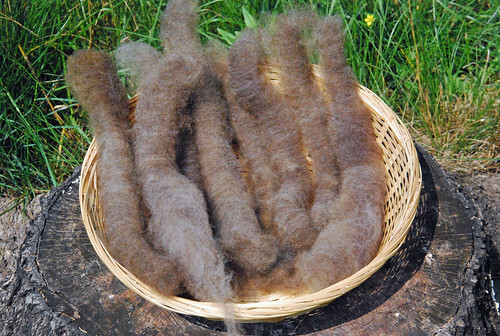 The grey fibre is yak/merino/silk top. Cheers for 2015, everyone! Looking forward to lots of projects, new friends, and especially becoming an Auntie! 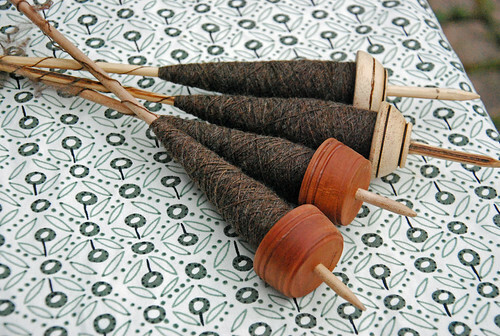 Categories: Holidays Happen, Spinning, Things Jamaican, Weaving | Tags: Books, cotton yarn, drop spindle, Flora, handspun yarn, Jamaica, Spinning, supported spindle, weaving | Permalink. 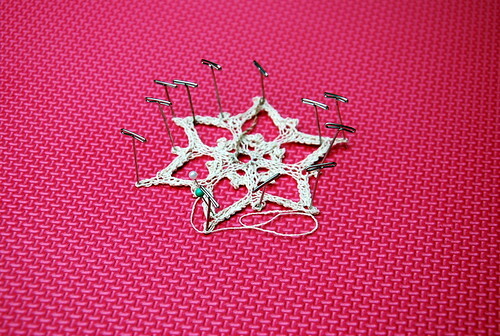 Oh, January, I see your cold and raise you a handspun, Paper Snowflake. 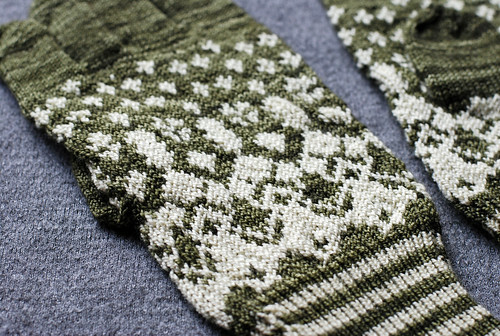 This wonderful knit pattern is by Naomi Parkhurst was ideal (ideal, I tell you!) 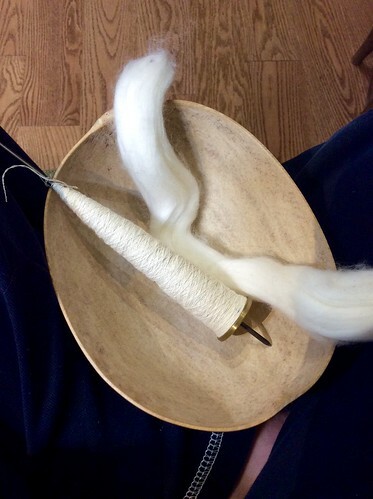 for my many hours-worth of 3-ply cotton yarn that I made with coin takhli spindles. As the pics show, this was made a while ago in better weather. It hangs on my studio bulletin board, and is an awesome reminder that small amounts are not useless. It has taken time but cotton seems to be here to stay. 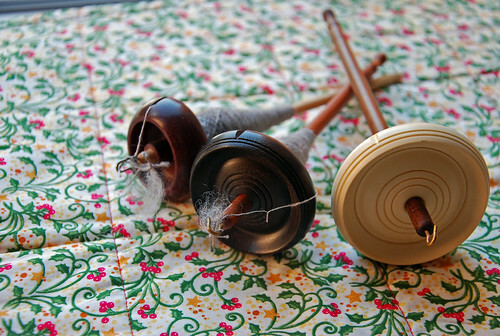 None of my cotton spindles is ever empty, and I gradually spin more. 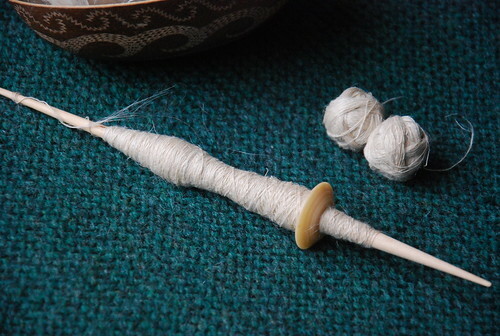 Spinning with the seed attached is amazing but I also figured out that if the Turkish distaff holds a length of top then I can spin it that way too. I am still getting used to this loss. 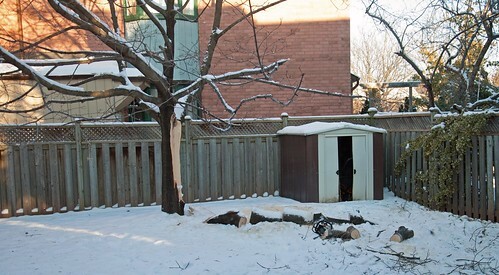 The tree had to be removed after the ice storm damage, and was a better candidate for the estate of my dreams than our suburban back yard, it’s true. 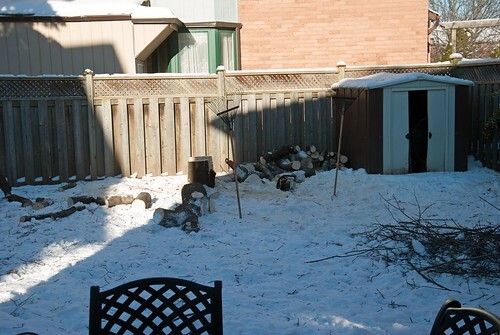 I had a full two deleted sentences re: neighbour activity. Let’s just say salt was rubbed in the wound shortly after I took this picture. It has been a wrench. Our home feels different with the new outlook. We can work with it (new window treatments, please) but first there’s that unwanted bill to take care of. N has made promises to chop the wood for the fireplace. Now that would be a fun development and a first! 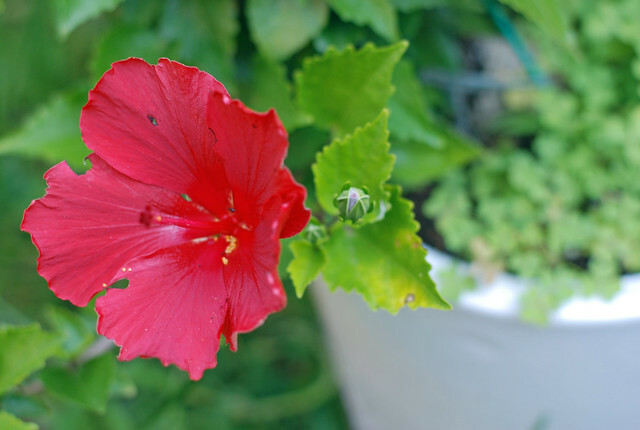 Of the many (as yet un-processed) things happening this month, I have a few to share. A third woven twill kitchen towel! Level 2 of weaving class started last week. 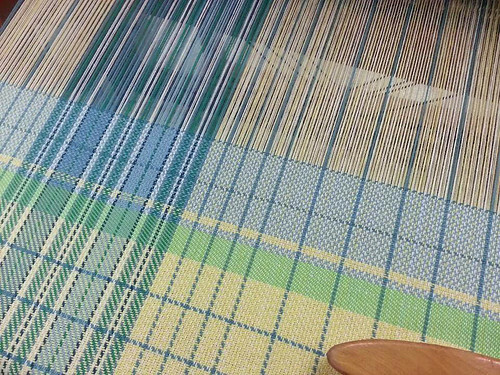 I am using all spare moments to get my twill towels woven. 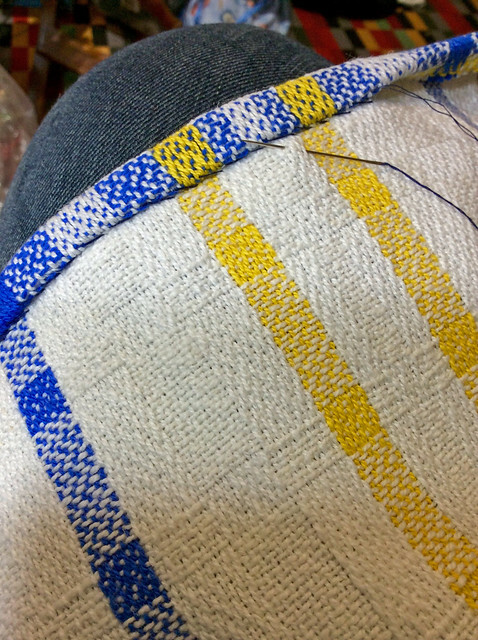 For this third towel, I kept the yellow weft but learned how to carry the slate blue up the selvedge. Most of the windowpane is 24 shots of yellow. I am carrying up by twisting in every fourth pick. Fourth and last twill kitchen towel! The fourth towel is underway. 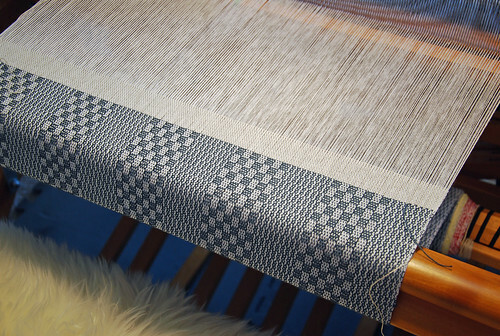 The weft is now light blue, and I am weaving it in broken twill. It is nice to not be as concerned with keeping an even beat. 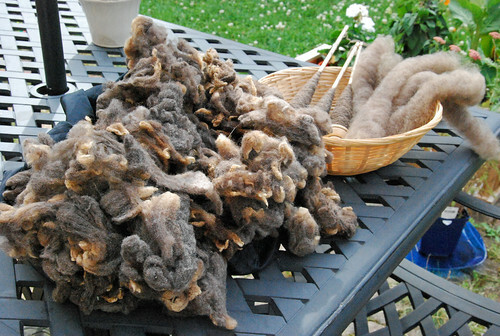 In between weaving sessions, I treated myself to a spin-in day at the Fibre Garden in Jordan. 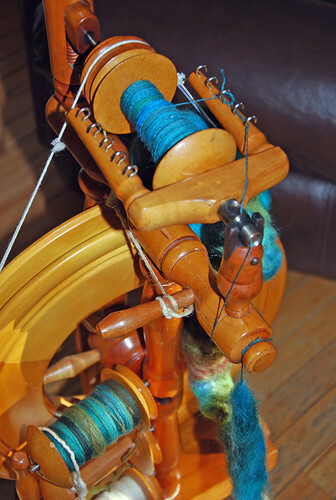 My Wee Peggy wheel is perfect for these events – she travels well, and is easy for me to spin and participate. 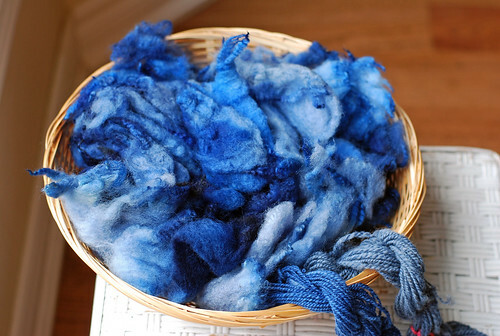 I am spinning Waterloo Wools polwarth hand-dyed top in the Tidepool colourway. 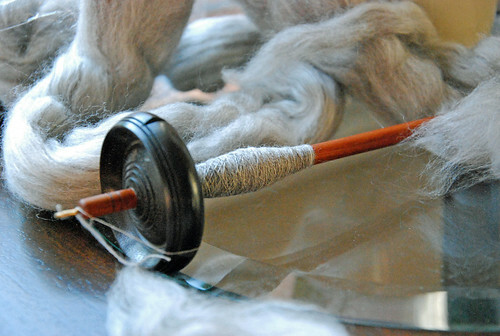 There is also much spinning here at home. 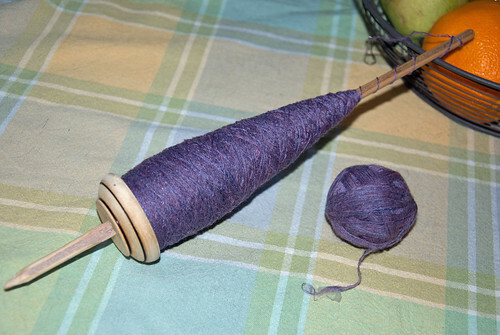 This yarn is now all plied up & finished. 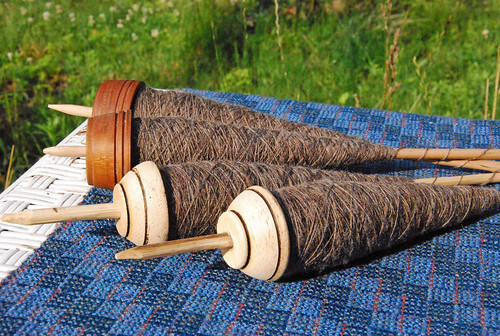 It is one ply of a lovely Entbatt, and one ply of bombyx silk – all spun on spindles. I will give better detail and yarn pics in a later post. 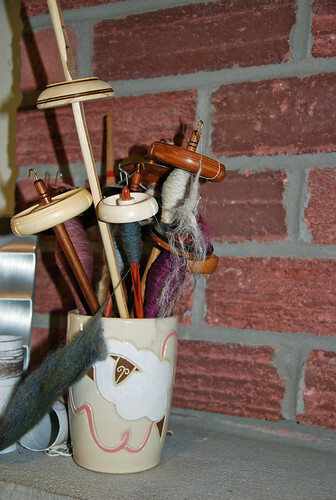 Categories: Finished & in the wide world, Getting the knack, Spinning, Weaving, What I'm up to | Tags: cotton yarn, drop spindle, Flora, handspun yarn, handwoven, kitchen towels, Polwarth wool, socializing, Spinning, supported spindle, Wee Peggy wheel | Permalink.